Rochas has launched Eau De Rochas Escapade Tropicale, a new summer flanker to 1970's Eau de Rochas. 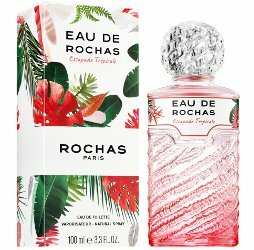 Eau de Rochas Escapade Tropicale follows 2016's Eau de Rochas Escapade en Méditerranée and 2017's Eau de Rochas Escapade Estivale. Notes for the fruity citrus chypre include lemon, blackcurrant, neroli, water fruits, mango, cedar, musk, ambroxan and raspberry. Rochas Eau De Rochas Escapade Tropicale is available in 100 ml Eau de Toilette. Bottle, bottle, love that BOTTLE! This looks really fun, like the Hawaiian Punch of perfumes.